The Huawei VR headset is the Chinese phone maker's best impression of the Samsung Gear VR using its own Huawei P9 handset. It creates an immersive 360 experience, even if the phone's 1080p display is noticeably inferior. Update: Our Huawei VR hands-on review now includes a video of us demoing the virtual reality headset. Watch it below. It turns out that looking through the Huawei VR headset on the other side of the world in China isn't too different from all of my other phone-based virtual reality experiences. These virtual reality goggles, announced at the Huawei P9 launch event in Shanghai last week, are a direct challenger to the Samsung Gear VR, and it really shows. In fact, it's hard to tell the two apart, given the fact that Huawei VR even matches Samsung's black-and-white design and mimics its 360-degree movies and games content. There's room for more than one phone-powered virtual reality headset, according to Huawei, and this one uses its Huawei P9 and Huawei P9 Plus display, with a focus on underserved VR fans in China and Europe. Strapping the Huawei VR headset to my face with instructions by its designers in broken English and my inability to understand one word in Mandarin Chinese didn't give me pause. Made in China? Taiwan? South Korea? The US? It no longer matters. All VR experiences is now universal, and I was able to secure Huawei's two straps and plastic viewfinder over my head easily and comfortably, just like I've done the Samsung Gear VR. In fact, it's so much like the Gear VR that there's a bumpy touchpad for gameplay and to swipe through menus, and a back button to retreat to the home screen, familiarly located on the right side of the headset. 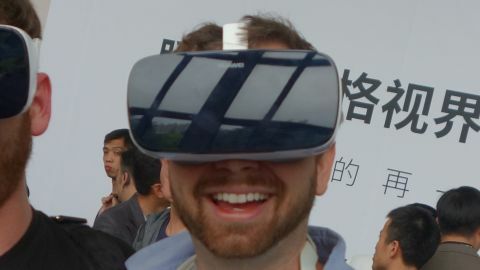 Huawei's VR headset even copped the focus adjustment dial at the very top and micro USB port on the bottom. Nothing has changed, except for the fresh 360-degree game and movie content from the 5.5-inch Huawei P9 Plus display. To make its headset stand out, Huawei promises a "very advanced" surround sound system to match its 360-degree video content if you plug in your own pair of headphones. I didn't hear anything groundbreaking from this prototype version of the headset, but it's still too early to judge. In fact, Huawei VR is so early that everything was written in Mandarin Chinese and not localized for English speakers. A lot of guessing and basic video game menu instinct let me start playing games and watching movies immediately. Rapidly tapping my way through a first-person shooter using the side-mounted touchpad was the highlight of wearing the virtual reality headset. Huawei 1, Alien enemies 0. There was no English name attached to this alien-based shooter, but it looked like a polished Android game app that I'd expect to see from the Google Play Store. Its 360-degree graphics were smooth enough as I turned my head in all sorts of directions, which is a testament to Huawei's HiSilicon Kirin 955 chipset and Mali-T880 MP4 GPU. Not quite up to par is the Huawei P9 Plus' display. The company touts it as Full HD to the public, but that just means it's 1080p and packing 401 pixels per inch. I could easily spot the difference between it and my Samsung Gear VR, which I had been using with a Samsung Galaxy S7. It trounces the P9 Plus with a quad HD display and 577 pixels per inch. I'm less bullish on 2K displays for day-to-day phone use. It's often overrated and a battery life drain. But when it comes to virtual reality, those extra pixels do make a difference. Huawei's phone display has a passable resolution for a VR headset, so I fully expect it to upgrade its screens for the Huawei Mate 9 and Huawei P10 over the next few months. Huawei seems to have successfully reverse engineered the Oculus-powered Gear VR headset for its audience, but it doesn't have access to the all-important Oculus Store. It's building its own VR content store instead. Content is king in among Wild West-like virtual reality ecosystems, and this is going to be where the Huawei VR becomes either a rousing success and an also-ran failure. Like its plastic VR headset, Huawei does its best to clone Samsung's software. It has a similar tile-based store that, unsurprisingly, has less content at the moment. Its demo reel is filled with games and movies, although some of the movies I tried out were 2D originals set in 3D theater environments. These "360-degree" knock-offs don't do VR justice. Huawei has to convince developers to make more games available for its store. That may be an easy task for entrepreneurial app makers who want to reach other parts of the world, like China. Early adopters may be waiting for a while for a killer app, though. You might not even notice it, but Huawei VR has a USB Type-C connection behind its plastic cover where the phone snaps backward into the headset. It's new reversible connection standard that's slowly replacing micro USB, and it's literally a natural fit here. Both the Huawei P9 and P9 Plus have USB-C ports. This means Huawei is the first major company with USB-C-compatible VR headset. Samsung Gear VR still uses micro USB, and it's one of the three reasons the Galaxy S7 and S7 Edge still use the older connection. I wouldn't say Huawei's method is any better or worse than the micro USB port Samsung still uses. You're not going to accidentally plug the Huawei phone in the wrong way, so there aren't any inherent perks with the new port. But it's does avoid the awkward jump Samsung's going to have to make in the near term with the Samsung Galaxy S8 and Samsung Galaxy S8 Edge. The Huawei VR headset was such a surprise announcement at the company Shanghai event that many of the internal representatives I talked to didn't know about it in advance. However, the fact that Huawei is working on a virtual reality headset is a shocker to exactly no one. Not after Samsung began using the Gear VR as a vehicle to sell more phones. Clearly the Chinese phone maker wants in on that idea, and is planning to do it in regions of the world where Samsung has yet to launch its headset, namely China and parts of Europe. There's no release date or price information, but I did ask enough times in gesture-filled English to know it'll be out in 2016 and very likely "this season," according to patient designers. What's interesting is that while Huawei often replicates existing ideas and sells them for a lower price, it won't be able to undercut its competition by much. Samsung promotions have gone as far as bundling a free Gear VR with new phone purchases. That means it's going to have to double its efforts to create convincing 360-degree content and show us that the 1080p display works well enough to power its virtual reality future. Better, not cheaper, is a new challenge for the Chinese phone maker.